Asian bookbinding traditions which can be found in the Southeast Asian manuscript cultures as well are the subject of a research paper by Colin Chinnery and Li Yi (International Dunhuang Project). This research paper combines textual descriptions together with diagrams illustrating binding techniques and photographs of a selection of objects. 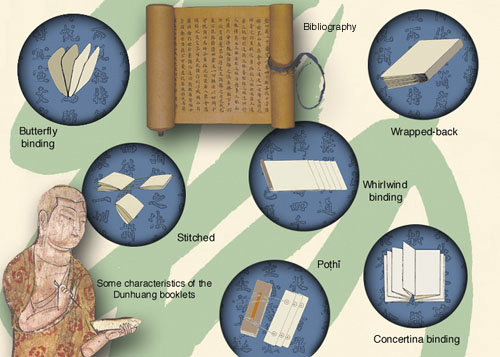 The aim of the paper is to give a comprehensive introduction to the different kinds of Chinese bookbinding contained in the Dunhuang collections. Included are details about butterfly binding, stitched binding, palm-leaf binding (pothi), whirlwind binding, concertina binding, and wrapped-back binding. The International Dunhuang Project is a ground-breaking international collaboration to make information and images of all manuscripts, paintings, textiles and artefacts from Dunhuang and archaeological sites of the Eastern Silk Road freely available on the Internet and to encourage their use through educational and research programmes. The IDP has partner institutions in Beijing, St Petersburg, Kyoto, Berlin, Dunhuang, Paris and Seoul which provide data for and act as hosts to the multilingual website and database. Much of IDP’s early work focused on conservation and cataloguing, both of which remain core activities. These have been supplemented in the past few years with digitisation, education and research. IDP started digitising the manuscripts in 1997 with the aim of bringing together the collections in virtual space. Its web site went online in October 1998 and allows free access to the IDP DATABASE with high-quality images of the manuscripts and other material, with cataloguing and contextual information. In this way, Silk Road material is becoming increasingly available to academic and general users alike.